There are many reasons why you should use video in recruiting. Using videos can help you reach more candidates, attract their attention, present your employer brand in a compelling way, increase your application rate and enhance candidate experience. Videos: A new recruiting holy grail? There is no doubt that video content was a king in 2017. In 2018 and beyond, the popularity of videos will only continue to grow. Experts estimate that by 2019 video will account for 80% of all global internet traffic. This is why more and more employers and recruiters have started incorporating the use of video in recruitment. Using videos in recruitment is definitely one of the recruiting trends you should implement in 2019. ➡️ Download our List of 15 recruiting trends to implement in 2019! How do employers use video in recruiting? 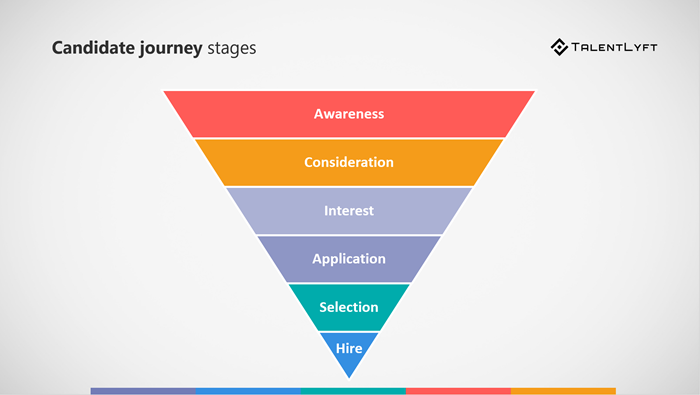 You can use videos in many different stages of candidate journey. 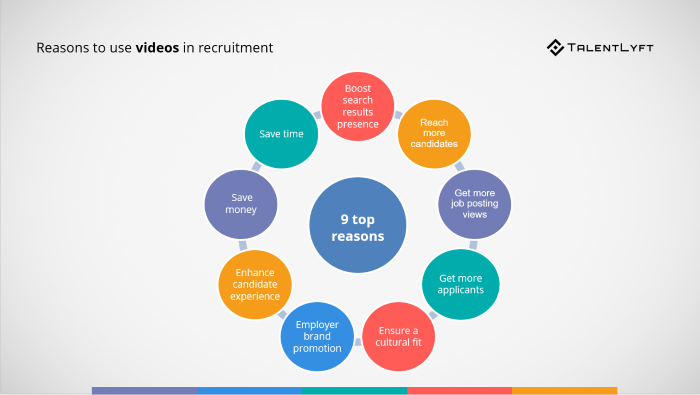 You can create video recruitment content for every step of the candidate journey. You can use videos to present your employer brand and employee value proposition, explain your hiring process, say thank you for applying, test and interview job applicants etc. Using videos in recruitment is a great way to boost your SEO efforts and improve your presence in search results. According to Brightcove, video drives a 157% increase in organic traffic from search engine results pages (SERP). In other words, if you add videos to your company career pages they will rank higher in Google’s search results. Simply put, Google loves videos! People also love videos! This is why people share videos more often than text and images. According to Wordstream, video generates an amazing 1200% more shares than text and images combined! In other words, if you add a video to your job postings, more people will share your job postings. As a result, your job postings will be able to reach a significantly greater number of people. In today’s candidate-driven job market, job seekers have many job opportunities. To hire the best people, you need to differentiate your job postings to attract their attention. A great way to do it is to add videos to your job postings. According to CareerBuilder, job postings with video icons are viewed 12% more than postings without video! Besides attracting the attention of your potential job candidates, videos are also great for convincing candidates to apply to your open job positions. 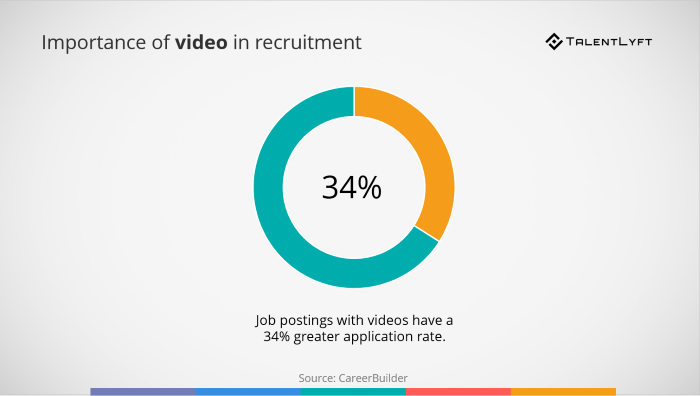 CareerBuilder survey has found that job postings with videos have a 34% greater application rate. In other words, by adding a video to your job postings you can get a significantly greater number of job applicants to choose from. A video is a great tool you can use to ensure a better cultural fit of your job applicants. If you present your potential candidates with a video which shows everyday life at your workplace, your potential job candidates will be able to imagine themselves working at your company. Thus, they will be able to assess if a job at your company is what they are looking for. As a result, your potential job candidates will self-select and opt out of your hiring process if they are not a good fit. Videos are perfect for promoting your employer brand and presenting your company as a great employer. You can use videos to tell a story about your company, highlight your company values and present your employee value proposition. You can also showcase your company culture and your workplace and give potential candidates a glimpse into an everyday life at your office. All this will help you do more than just tell candidates that you're a great employer. By using videos, you can literally show them how great is to work at your company. Videos are most commonly used in the attraction stage of the candidates' journey. A video is a powerful medium which can be used to present your employer brand and company culture and sell your employe value proposition to your potential job candidates. This is why many companies have started adding videos at their career site and sharing videos on their company’s social media profiles and using them in their cold recruiting emails. Indeed, video recruiting emails are a great way to win the best job candidates. However, videos can also be used in the later stages of your hiring process. Videos are a great way to deliver a differentiated message to your job applicants! By using videos you can ensure a timely and personalized communication process throughout your hiring process, which can significantly improve your candidate experience. Since job postings with videos attract more job applicants, you won’t have to waste your time promoting your open job positions across numerous different channels. You will be able to get more applicants in a shorter period of time. As a result, you will significantly shorten your whole hiring process and improve your time to hire. Finally, you shouldn’t neglect the power of using videos for screening and interviewing. Video interviewing process will save you the time needed for scheduling, traveling and welcoming candidates in your office. Since job postings with videos have more views, shares and higher application rate, you won’t have to spend so much money on promoting them to get a sustainable number of job candidates in your hiring pipelines. Another way using videos in recruitment can save your company’s buck is by conducting video job interviews. An Aberdeen Group report, ROI of Video Collaboration, found that 72% of managers surveyed identified “reduction in travel costs” as the primary reason for using video interviews. Using video in recruitment can improve your whole hiring process. Using videos can help you reach more candidates, attract their attention, present your employer brand in a compelling way, increase your application rate, test and interview candidates, communicate with your job applicants throughout your hiring process and enhance candidate experience. How to get started with using video in recruitment? Even if you have no budget and no previous experience, you can easily create original recruitment videos to serve your company's hiring purpose.